You are here: Home / Tips / Are Trampolines Safe? Are trampolines safe? This is a question being asked more and more today as the number of injuries caused by bouncing and performing tricks on a trampoline skyrockets. Trampolines come in a variety of shapes and sizes, from the large backyard trampolines to the mini-trampolines designed for adult exercise to entire trampoline parks in which hundreds of adults and children bounce and flip simultaneously. And while bouncing on a trampoline certainly has its benefits, many parents—and those in the medical community—are beginning to question whether these benefits are worth the risk. In the following article we will discuss trampolines in a bit more detail, starting with some of the benefits to be had by the sport. We will also discuss some of the genuine risks of trampolining and the large potential for injury that the current statistics are beginning to highlight. Finally, we have provided a fairly comprehensive section on trampoline safety—tips and advice on how to be safe when using a trampoline. There are many benefits to bouncing on a trampoline, even though some of these benefits are starting to be questioned due to the risks involved with the sport. First, trampolining is fun—the joy of feeling weightless, if only for a moment, is enough to bring a smile to anybody’s face, both young and old. Mini-trampolines, the type used for aerobic exercise, also offer many benefits, as does bouncing in the large trampoline parks. There are many health benefits of bouncing on a trampoline. Traditional cardiovascular exercise can seem boring, but it is always more fun on a bouncy surface. Those with knee problems, perhaps from running or using or a treadmill, laud the low impact experience they receive from exercising on a mini trampoline. Moreover, trampolining is a great way to raise the heart rate as you try to soar higher and higher with every jump, and raising your heart rate can get you into what is known as the “fat burning zone” to lose those pesky calories. Vigorous bouncing can also improve your mood, as the activity helps to release endorphins in the brain; and the unstable moves and muscle reaction speed involved with bouncing on a trampoline help to build both bone density and muscle reaction speed, similar to the way plyometrics achieve that goal. Going back to the question we asked at the onset of this article—Are Trampolines Safe?—the answer seems to be a resounding “no.” Trampoline accidents and injuries are responsible for thousands of emergency room visits each year, and as the popularity of large commercial jump parks continues to soar, experts believe that number will only go up. 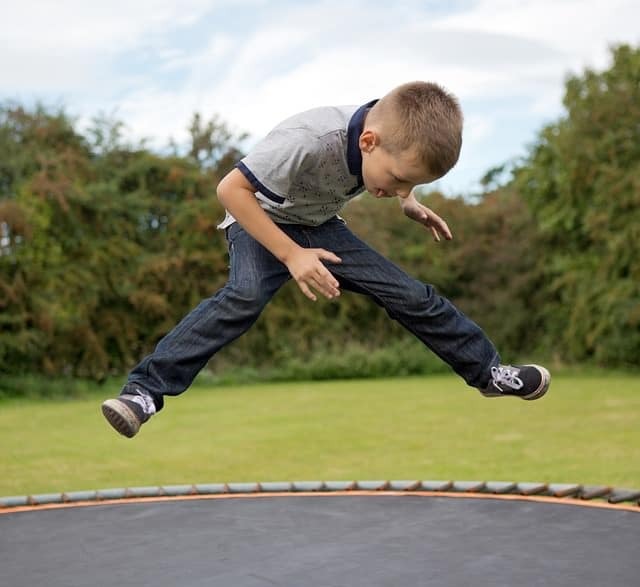 Trampoline mishaps are responsible for many scrapes and bruises, broken bones, torn ligaments, head injuries and even a few life altering injuries, including paralysis. Recently, the University of Michigan reported that medical associations across the country now recommend banning trampoline jumping in places like backyards, schools, playgrounds, etc due to the risk involved. And the risk presented by trampolines not only applies to children, but to adults as well. The damage caused by trampolines can range from strains and sprains to fractures to more serious head and neck injuries, and while most accidents happen at home, more and more these days are beginning to come from these full-scale jump parks in which jumping is pretty much a free-for-all activity, with very little supervision. According to statistics, more than half of trampoline accidents occur on the jumping surface itself, and about two-thirds of all accidents occur when two or more people are jumping together. So what about those mini-trampolines used primarily by adults for cardiovascular exercise? Are they safe? Not really. Although they seem to be a bit safer than backyard trampolines and jump parks, there are some risks involved with these mini jumpers. An analysis of injury data regarding mini trampolines showed that nearly 100 percent of the injuries caused by mini trampolines were mild enough to allow the patient to be treated and released, while 5 percent of backyard trampoline accidents resulted in hospital admittance. Most mini trampoline injuries are caused by the participant missing the jumping surface, leading to twisted ankles, strains and sprains. So while there are some cardiovascular benefits to working out on a mini trampoline, statistics seem to show you would be better off with more traditional forms of exercise, at least from an injury/accident standpoint. Small children, whose bones have not yet quite developed, are about twice as likely to be injured on a trampoline as bigger kids. And when it comes to serious injuries—such as cervical spine injuries—falls are the major culprit. What’s more, most of these falls are caused by botched flips and somersaults. This is not hard to picture: a child goes up high on the trampoline and begins a flip, one that forces him to take his eye off the trampoline, but instead of coming down in a standing position on the mat he falls on the back of his head or neck—either on or off the jumping surface. The risks of trampolining are so high that some people have called for their total ban, but with millions of these jumping hazards already in circulation, in addition to the large proliferation of jump parks, this does not seem likely any time soon. If you Google the search phrase “trampoline safely guidelines,” you are bound to see hundreds if not thousands of results. Many of these, however, are published by trampoline manufacturers—companies that have a vested interest in your continued use of trampolines. Instead, here we will provide you with some neutral information you will hopefully take to heart. If you own a trampoline and want to help reduce the risk of unnecessary accidents and injuries, these safety guidelines, published by the US Consumer Product Safety Commission, can help protect you and your child and demonstrate how to use the trampoline a bit more safely. To avoid some of the most serious trampoline injuries—and possibly even a fatality—take the following measures, says the Commission—steps that can also help avoid minor injuries such as bruises, scrapes strains, sprains and fractures. Do not attempt or allow somersaults and flips—landing on the head or neck can cause paralysis. Do not use a trampoline that lacks shock-absorbing pads that completely cover the springs, hooks and frame. Place the trampoline away from trees, structures and other play areas. Full-size trampolines should not be used by anyone under the age of 6. Do not use a ladder for your trampoline, as it provides unsupervised access by small children. 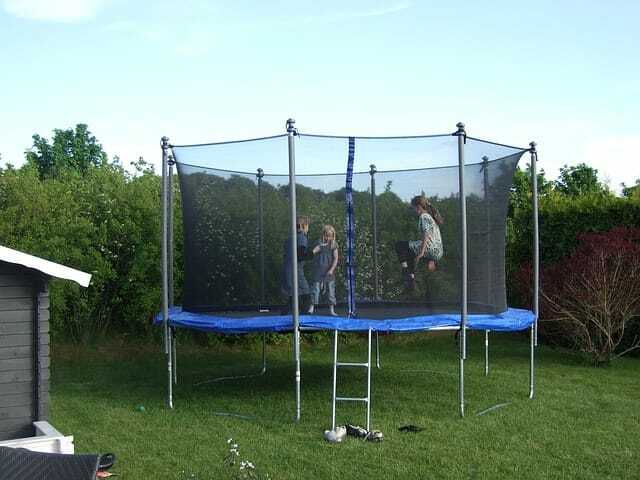 Trampoline enclosures/nets can help prevent injuries from falls off trampolines. Inspect the trampoline. Time, weather conditions and the previous jumping session can cause damage to the trampoline of which you may not be aware. Thus, it is always wise to inspect the trampoline thoroughly before each use to check for rips, tears, spring padding, etc. Getting on and off the trampoline. Participants should always climb on and off the trampoline. Never use it as a springboard to dismount. How to stop bouncing. You can slow or stop your bouncing by flexing your knees as they come in contact with the trampoline mat. Not too high! The higher you go on the trampoline, the less control you have. Hence, you should avoid bouncing too high to maintain control. Bounce in the center of the mat/bed. Most accidents occur from landing on the springs (or the ground). Try to bounce in the center of the bed to avoid this. Never bounce when tired or “altered”. Avoid using the trampoline when you are tired, as being tired lessens your reaction time. Also, it goes without saying that drugs and alcohol are taboo when using a trampoline. Keep all objects away. Never bounce with or near other objects like balls, etc., as this can increase your chance of injury. Using a trampoline can be fun and offers plenty of health benefits that cannot be ignored. However, stunts on the trampoline are also the direct cause of injury, some of which can be major and life altering. If you insist on using a trampoline, please try to observe and follow all the safety precautions laid out above. Doing so just might save your life.